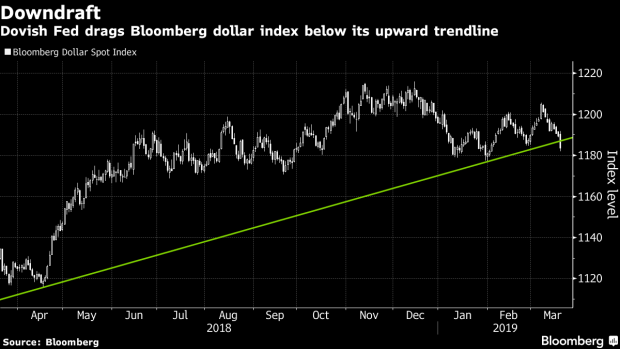 (Bloomberg) -- The dollar sank with Treasury yields after the Federal Reserve signaled it won’t raise interest rates this year, saying economic growth has slowed. Asian stocks looked set to track declines in U.S. equities. The Fed’s stance was more cautious than many had forecast, sending the yield on 10-year Treasuries down to 2.52 percent. The S&P 500 Index initially climbed on the prospect of rates not rising for the foreseeable future, but closed the day lower as declines among financials weighed on the index. Japan is closed for a holiday, while futures indicated lower starts for equities in Australia and Hong Kong. Waning momentum in the U.S. economy and other parts of the world signal concern at the central bank is growing, as the Fed flagged that it will keep rates on hold went further than the one-hike forecast analysts in a Bloomberg survey had expected. Treasury yields, already declining amid increased worries about the global expansion in recent weeks, plumbed fresh lows for 2019 on Wednesday. Traders are betting there’s a 50-50 chance of a U.S. rate cut this year. Investors were also weighing President Donald Trump’s latest remarks on trade. The U.S. president said Wednesday that tariffs on Chinese goods will remain in place until the nation complies with a trade deal that has yet to be sealed. The news weakened industrial stocks in the U.S. In Hong Kong, the de facto central bank again bought the local dollar after the city’s exchange rate fell to the weak end of its trading band against the greenback. The Hong Kong Monetary Authority bought HK$3.54 billion ($451 million) of local currency early Thursday. Elsewhere, the pound slid as pressure built on Theresa May to gather a majority for her Brexit deal. The U.K. prime minister asked the European Union for a three-month extension to the March 29 deadline in a move that increases the risks of a no-deal departure. Company earnings this week include Tencent, Tiffany, Nike and PetroChina. Central banks in the U.K., the Philippines and Indonesia are all scheduled for policy meetings. Euro-zone purchasing manager survey numbers on Friday will give an indication of the health of the region’s industrial and service sectors. Futures on Australia’s S&P/ASX 200 Index fell 0.2 percent. Futures on Hong Kong’s Hang Seng Index earlier dipped 0.4 percent. The S&P 500 Index fell 0.3 percent. The yen was at 110.69 per dollar. The offshore yuan held at 6.6877 per dollar. The Bloomberg Dollar Spot Index fell 0.5 percent to a six-week low. The euro traded at $1.1423, up 0.1 percent. The British pound was at $1.3193. The yield on 10-year Treasuries decreased eight basis points to 2.53 percent, a 14-month low. West Texas Intermediate crude gained 1.6 percent to $60.23 a barrel, a four-month high. Gold held at $1,312.55 an ounce. --With assistance from Sarah Ponczek, Andrew Dunn and Robert Fullem.